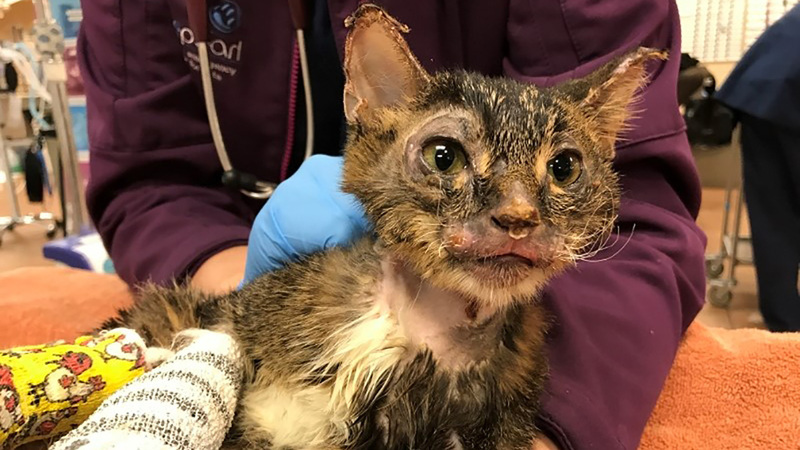 MIDTOWN, Manhattan (WABC) -- A kitten that suffered severe burns over 40 percent of its body is beginning to thrive as he recovers at a New York City animal shelter. A Good Samaritan found the kitty, dubbed Hugh Jackman, on Liberty Avenue in Brooklyn with injuries to all four legs, his ears and his nose. That person brought him to the Animal Care Centers of New York City (ACC) before he was transferred to BluePearl Veterinary Partners, where he has been getting round-the-clock veterinary care for the past two weeks. "He's an extremely tough cat," BluePearl veterinarian Dr. Meredith Daly said. "He's just tough as nails, and he's such a good boy." It is unclear if injuries came from abuse or a terrible accident, but the ACC is asking the public to pass along any information and also to make donations for his care. "It's horrifying to see such abuse," ACC chief operating officer MeLissa Webber said. "We are grateful that Hugh was spotted on the street and brought to our attention." Hugh Jackman had extensive burns on all four of his legs, as well as trauma to the bones of his feet and loss of his fur. The tips of his ears were burned off, and his chin, nose, and eyes were also badly damaged. ACC staff determined that his injuries were so severe he needed to be taken to BluePearl's Midtown hospital. Dr. Daly said that in spite of Hugh's extremely painful injuries, he enjoys his time with the BluePearl veterinarians and technicians who change his bandages daily, and he even nuzzles and cuddles them.